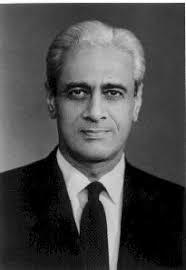 Satish Dhawan (25 September 1920 – 3 January 2002) was an Indian aerospace engineer, widely regarded as the father of experimental fluid dynamics research in India. Born in Srinagar, Dhawan was educated in India and further on in the United States. Dhawan was one of the most eminent researchers in the field of turbulence and boundary layers, leading the successful and indigenous development of the Indian space programme. He succeeded M G K MENON, as chairman of the Indian Space Research Organisation (ISRO) in 1972.